Last week I was wondering to myself, “Self, the weather has been incredible this growing season. 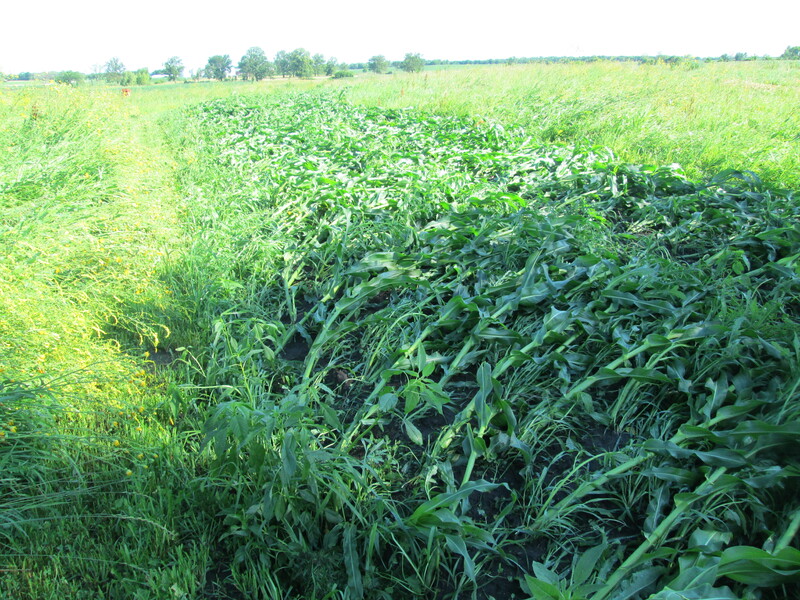 What would it take to make it no longer the best growing season ever?” The answer is Tornado. The answer is always Tornado. And, of course, that’s just what we got last weekend. We awoke Friday night at 11:30 to driving rain, constant lightning illuminating a yellow sky, and winds that shook the house. For the next hour, we had sustained winds nearing 100mph and 3 ½” of rain over about half an hour. The actual tornado touched down just half a mile north of us and went in a straight easterly line for about three miles past our house. If you saw any of the damage on the TV, those were our neighbors immediately to the north of our farm. We came through the storm fairly well, with no damage to our family or house (the boys somehow slept through it!). 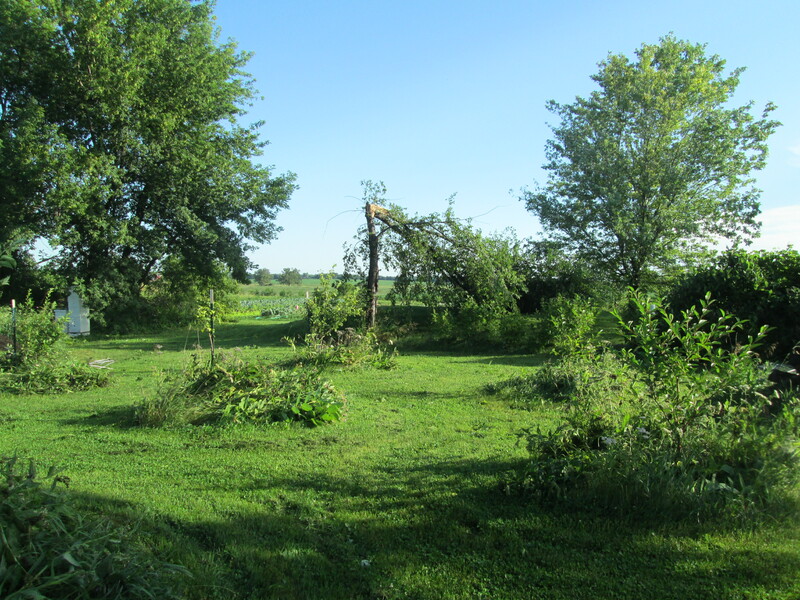 We lost four mature trees and sizable branches off of every tree on our property. The worst damage was a branch that fell on our power line and pinned it to my truck. 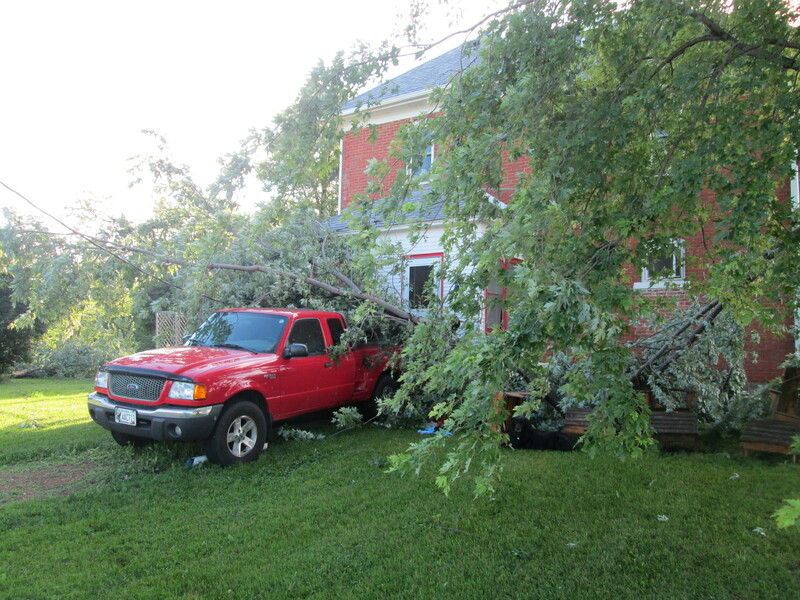 The truck is mostly ok, but we were without power for 40 hours while we waited for an electrician. We are so thankful to our family members who sweated out a full day on Saturday cleaning up the branches and getting the farm back in order. Thanks! I can’t believe how ok the fields are. The corn was completely horizontal after the storm, but it has stood back up and looks like it might recover. Many fragile leaves on lettuce, basil and chard were shredded but will still be edible. So life goes on, and while this is no longer the best growing season ever, you might not even notice the tornado in your boxes this summer. And while no one has done a study, I’m pretty sure that eating veggies that survived a tornado will make you invincible. It seems hard to believe, but we are now one third of the way through this growing season. Hopefully we are 100% done with tornado season. I usually break down the season to six weeks of spring (dominated by salads, green onions, and stir-fries), six weeks of summer (tomatoes, cucumbers, squash, corn), and six weeks of fall (roots, winter squash, greens, and storage crops). That leaves 34 weeks of winter, which seems about right for Minnesota…. As we transition into the summer season, we will be offering the last green onions, broccoli, and cabbage for a while. I plant all of these again for the fall, but we will indeed be getting a break from them until then. We have a few of what I usually consider “summer” crops that snuck into the lineup this week. Beans are off to a great start and gave a strong harvest for their first week. We grow a beautiful mixture of green, yellow, purple, and “Dragon’s Tongue.” A couple years ago the Dragon variety switched its name to “Dragon Langerie,” probably just on the assumption that French food words sound more exotic (or just pricier), but I’m sticking with my freedom fries and dragon tongues, thank you very much. We also have enough summer squash and cucumbers to give a few this week. Some of the squash got a little big since I wasn’t able to harvest it on Saturday in the chaos of tornado cleanup. It can be grated and used for zucchini cake if it is too massive for any other use. Also, I’m harvesting a few green peppers before they start to ripen at all. The pepper plants were really whipped around by the tornado and they haven’t recovered much. I’m hoping that by harvesting their earliest fruits they can focus their growing energy on their leaves and plant bodies, and then reboot with more fruits in a few weeks. Most of the peppers we grow are an Italian heirloom, “Carmen.” These taste just like the usual bell peppers, but they are absolutely beautiful and I’ve never seen them in a grocery store. Additionally, we have a few of the usual bell peppers, some purple peppers, and hot peppers (I’ll make a note when we deliver these so they aren’t confused). Also this week we have the crown jewel in our triple crown of cabbage, a green pointed variety named “Caraflex.” Aside from being a stunningly beautiful crop, the shape of this cabbage made it a useful horn that we put to good usage during the tornado. When the wind drowned out the local tornado siren, our whole family ran to the field and blew with all of our might into the horned end of the Caraflex. The resounding wail of the cabbage-trumpet woke the neighbors and saved many, many lives. Expect to see cabbage horns in your next marching band performance. or 952-353-1762. Otherwise, we’ll try to plan a farm open house in late August and our annual harvest festival in September. Thanks for your support this year! We had no idea there was a touchdown. Glad you’re all safe. Our 1.5 inches of rain overnight pales in comparison. ☔ Michelle and Duncan. Will attend an event later in the season.